Egyptian home decor is inspiring for those who love ancient Egypt culture and are fascinated by the ancient Egyptian period. In November 1922, the English Archeologist and Egyptologist Howard Carter, financed by Lord Carnarvon, discovered the famous Tutankhamun’s tomb. To surround yourself with the mystery of the magnificent Egypt you can use Egyptian theme decor and create your very own Egyptian theme room filled with Egyptian-inspired wonderful things. 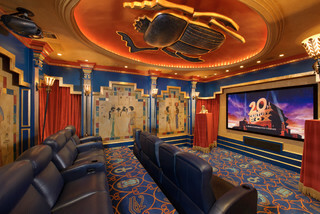 Take a look at few photos of Egyptian-themed rooms. No matter if you just bought a home or are on a mission of renovating an existing one picking up home decor theme, style and accessories is an exciting moment. Some people are really obsessed with this endeavor, others not so. What’s important is do whatever feels right to you and brings your satisfaction and joy. People are so different when it comes to opinions, decisions making, preferences, and the way of thinking. Few years ago when I was living in St.Maarten, an island in the northeast Caribbean, I met very pleasant l and well-educated woman from New York. She was vacationing alone, recovering from a divorce. When first got married and bought a house she wanted to have the bedroom decorated in an Egyptian theme as she has always been fascinated by ancient Egypt period. However, her husband insisted all modern style. So that’s what they did. Years later and divorced she saw an opportunity to do what she always wanted to. Her home now has not only an Egyptian theme bedroom, but it is surrounded by paintings, hieroglyphics, and artwork of this ancient time of mystery. The pictures of the house I saw were infused with inspiration and relaxation. So if you have an artistic idea of how you want your home, room or kitchen to look don’t wait, just go with the flow and do it. Do not pay attention to those who don’t have your creative way of seeing things. 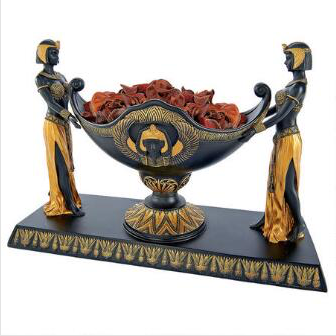 I have selected some elegant Egyptian home decor from Design Toscano to share with you today. They are the country’s premier source for statues and other historical and antique replicas. Their products are of high quality and exclusive design. This magnificent multi-dimensional artwork is cast in a high-quality designer resin and finished in faux gold and ebony colors. True period replica. Accepts your 25-watt candelabra bulb. The soft glow from a glass ”flame” shape is perfect for your bedroom. 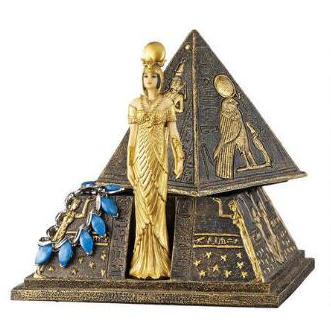 The Goddess Isis can be lifted with the lid from this double-tiered, Egyptian pyramid treasure box. Keep your valuables in a secret hiding place. Design Toscano exclusive, hand-painted in faux ebony and gold. 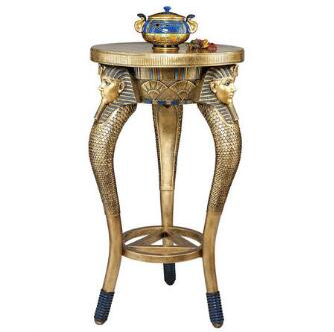 Bring a sense of exotic with this perfect side table or entryway with lavish details of the ancient Egypt. 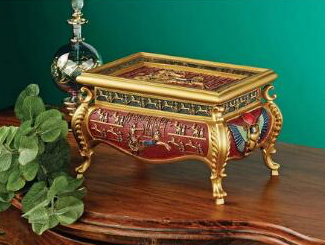 Exceptionally hand-painted with faux gilding and the rich colors of the Egyptian palette. Beautiful decorative art. 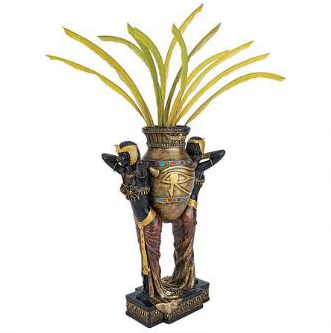 Place scented petals or dry flowers inside the urn and enjoy this richly decorative Egyptian Revival work art. A fascinating ancient Egyptian symbol of protection, good health, and royal power. This delightful fine art, hand-painted in the rich colors of the Egyptian palette can be displayed as is but is also ready to hold your dried arrangement creations. Egyptian-style treasure box enhanced with scarabs, chariots, and hieroglyphs. High-quality Design Toscano sculptural box, stylishly hand-painted exclusively for Toscano. Lift the lid and place your wealth inside, who knows it may double? Two Isis figures, one on each side of this well-crafted quartz clock are spreading their wings, riding a foot-long barge. 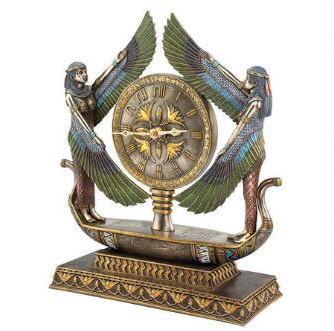 The sculptural clock is a stunning Egyptian Revival work, true to the decorative arts of the 1920’s. Style and function are merged and are ready to radiate in your home. Add an Egyptian touch to your home with this highly functional art. 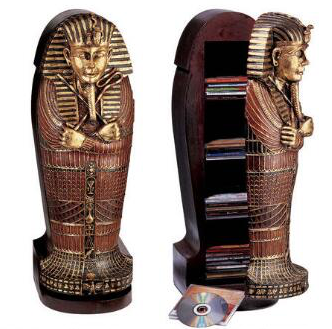 The sarcophagus of the cherished King Tut has inside four shelves that can hold 56 discs and it is handcrafted of solid wood with resin details. It is finely hand-painted in regal faux gold and a palette of jewel tones. 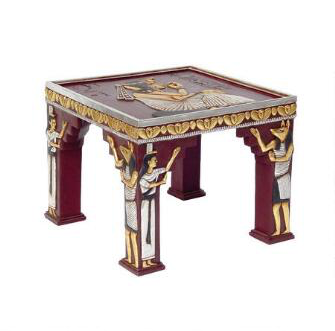 Anubis, hieroglyphs and temple priests are adorn in this high-quality designer resin occasional table. Hand-painted in faux gold and silver the furniture art brings a dramatic and exotic accent to any Egyptian decor. The few ideas I just presented would for sure create ancient Egypt ambiance in your home. Would these decorative art pieces be an excellent gift for any other occasion? Absolutely! Don’t hesitate to explore your creativeness by looking for an ancient Egyptian home decor or ideas on how to do an Egyptian theme room. Not all of us like the same things in life and this is great. If your passion for ancient Egypt is within you and would make you feel great surrounded by the exotic accent from the ancient Egypt period then just do it even by adding just one piece of art in your home! Please share with us your thoughts! Are you inspired by magnificent ancient Egypt? Great idea offering decor for setting up a theme. Typically you’ll hear about going to certain hotels in locations where you can stay at themed rooms to enjoy and relax in according to your interests. 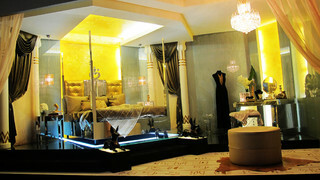 The products you offer here will definitely get you well on your way to having a great looking Egyptian theme room. I think that the Egyptian room does make for an excellent bedroom theme. Thank you, Travis, for your comment! I also think an Egyptian bedroom would be really great. And you don’t have to go crazy to creating it. It’s all about bringing something different and exciting! Hi, Christina and thank you for stopping by and commenting! I am too fascinated by the ancient Egyptian civilization. Having an exciting and inspiring home decor would definitely infuse your house with a great energy. Wow! I didn’t know there were places you could go to and purchase beautiful pieces like this for your home. I’ve always had a love of Egyptian history, mythology, and heirlooms. I watch everything I can on the subject and love seeing pieces in museums. Of all of these here, my favorite is the Kind of the NIle Occassional Table. It is very beautiful and looks like it’s very high quality. Do you know if these are good quality products that don’t break easy? Thank you for your comment! Design Toscano is the country’s premier source for statues and other historical and antique replicas. Their products are high quality so you will not be disappointed. I agree that King of Nile Occasional Table is very original and beautiful. Glad you liked it! I’ve always considered Egyptian decor to be an extremely beautiful one, it seems so luxurious and elegant to me. I think it has an unique style and charm. My favorite from your list is by far that King of Nile Table, it looks absolutely gorgeous! Oh my, now that is what I call absolutely magnificent! stylish, brilliant, classy, elegant all rolled into one. Anyone who has a home decorated like the ancient Egyptian period most definitely has en eye for style or their interior decorator does. I’d love, a bedroom like the one in the first photo! Thank you, Derek, for your comment! I do agree with you. A home decorated like the ancient Egyptian period it’s stylish. 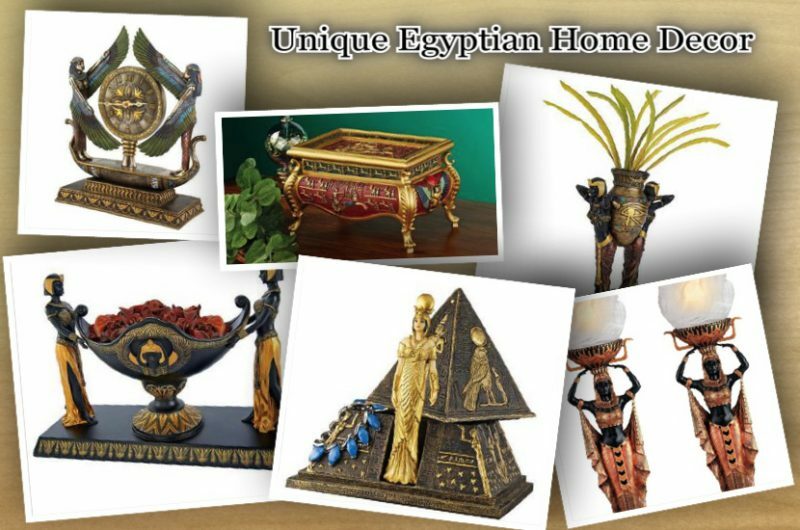 I read an article that houses with Egyptian Home Decor have a better value, there were some examples and pictures as well of a well and elegant home decor using an Egyptian theme. Really great article & I love the ancient Kemetic (Egyptian) theme! I have a friend who has all African art and Kemetic themed rooms and it’s really cool! I really like those table lamps too! Keep up the good work and bringing the awesome ideas! Thank you, Derek, for stopping by and commenting! I am glad you enjoyed the article! I am fascinated by the Egyptian culture and I found more people who are also intrigued by it too! 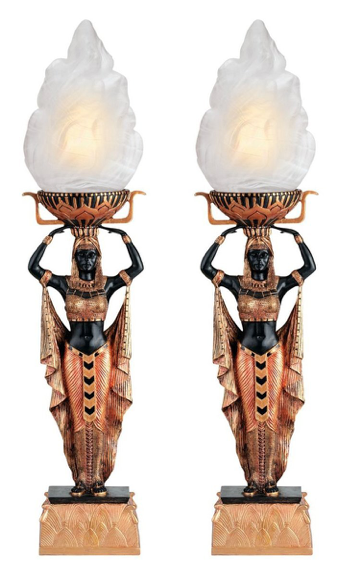 I agree that the lamps are a great addition even if your room is not in an Egyptian theme! Love this unique approach, as you don’t see to many Egyptian themed rooms anywhere. These interesting people had some of the most interesting symbols and structure man has ever know and to incorporate this into decorating is paying homage to one of the greatest civilizations ever. Keep ideas like these coming, I just love them. Thank you, Dan, for your comment! I actually saw and Egyptian decorated bedroom a few years ago when we were touring properties for sale in Florida. I did fall in love with that room as it was very tastefully decorated. I am glad you loved this idea too!